Mt. Etna has a unique relationship with Sicily, particularly with its surrounding towns. In 1669, Mt. Etna erupted, killing tens of thousands of inhabitants in Catania and other nearby towns. In the aftermath of this catastrophe, Catania rebuilt itself using the dark, volcanic rock from Etna’s eruption (giving much of Etna’s old center is dark color). Today, Mt. 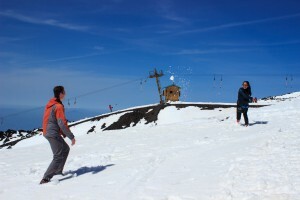 Etna serves as a popular ski location and sees visitors from all across Europe late into the spring. Riding a gondola partway up, I could not help but feel that there is something sad about the taming of this great natural landmark. Still, the sight of pure-white snow next to the absolute black of volcanic rock towering above the green hills and blue Mediterranean add a final layer of contrast in this great island. Who could imagine that we would end our incredible journey with spring break snowball fight? It is nearly inconceivable that thousands of miles away you might have the chance of bumping into other Bowdoin friends and faculty. We were fortunate enough to bump into Professors Franco and Pearlman on the steps of a Greek theatre in Syracuse. If anything, this coincidence reminded me that the world of Bowdoin is larger than initially imagined. 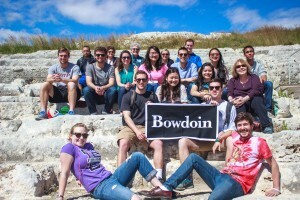 As a nearing graduate, I am comforted in the thought that Bowdoin community promises to support all of us even when we move beyond the comfortable, drowsy hills of Brunswick. The people we meet and the knowledge we gain through our travels and trials will serve us throughout our lives. There are few greater gifts out there. 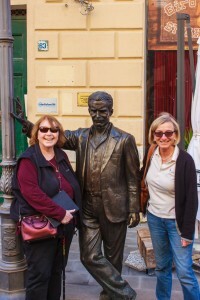 No one could be more enthused to run into the bronze and whiskered character of Montalbano in the coastal town of Porto Empedocle than our very own Professors Boyd and Gavioli. This well-known character canvasses various cases through the famous “gialli” (detective novels) of Andrea Camilleri. Port Empedocle, the short visit to start our fifth full day, is the coastal town that inspired much of the setting of Montalbano’s fictional home town of Vigàta. 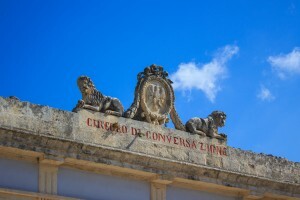 While we were unable to spot the elusive Camilleri at his coffee shop, we enjoyed the chance to walk down the streets of the colorful and odd town. Every adventure requires a bit of spontaneity and, while it was not the first time, our stop at Selenunte stands out as one moment where I was grateful to be surrounded by avid adventurers. 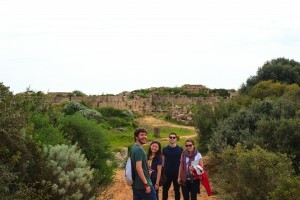 Given the chance to make our way to the acropolis on our own, we carved our own trails through the thick underbrush, over hills, and through tunnels of ancient fortifications. These unplanned moments often gave me the greatest views of places we viewed: whether it be the unvisited rear of the acropolis or the side streets of a great city, it is the road less traveled that yields the greatest treasures.